· to strengthen the permit conditions in order to stipulate start times for the required reclamation of the lands and restoration of cultural sites within the old quarry. Above all, we asked for public site visits to both quarries. They are located on Grove Farm Company property and are restricted areas. The results of this effort, so far, are both discouraging and positive. In 1992, Grove Farm Company, which also owned quarry operator Grove Farm Rock Company, applied for the land use permits for a new quarry. In addition to County use permits, a special permit for an industrial use within the agricultural district had to be approved by the County Planning Commission and the State Land Use Commission. Grove Farm representatives testified that there was a critical, island wide need for quarry material and stated that the old quarry was near depletion. The permits for the new quarry were approved in 1993 subject to eleven conditions. A. 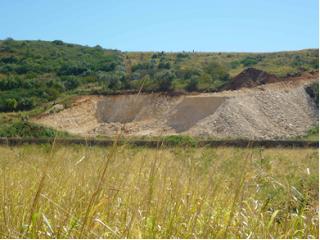 The permit required that new quarrying operations commence no later than two years after the permit was granted, i.e. 1995. In fact quarry operations began in January 2010. B. The permit required that old quarry be closed two years after grading and grubbing for the new quarry started. The recent hearings did establish that the old quarry must close on August 19, 2011. C. The new quarry permit stipulated that sale or transfer of ownership interests in the subject property prior to completion of the new quarry would render the permits null and void. In 1998, Grove Farm transferred the quarry permits and operations to Jas W. Glover Company by a license agreement. 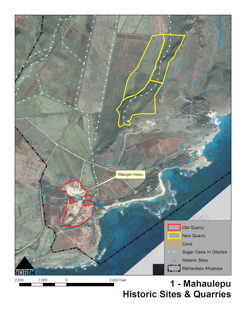 Malama Maha`ulepu maintains that ownership interests in the quarrying materials have been transferred though the property itself has not been sold. Malama Maha`ulepu asked the Kauai Planning Commission to append the license (or at the very least, terms about its duration and the assignment of responsibilities for the permit conditions) to the permit which is recorded at the Bureau of Conveyances. D. Land reclamation plans for both the old and new quarries were required. Malama Maha`ulepu is seeking a copy of a 1995 reclamation plan for the old quarry. New Quarry in April 2010. Horseback riders on left edge of mine provide sense of scale. E. Finally, the State Historic Preservation Division required that Waiopili Heiau, located in the old quarry, be restored when the old quarry was abandoned. This condition continues to be of primary importance to the Koloa community because in 1974, a surface survey of the Weliweil, Paa and Maha`ulepu coastal areas was conducted by archaeologist Francis K. W. Ching and co researchers Steven Palama and Catherine Stauder. The study identified Waiopili Heiau, along with Waiopili Spring and Kapunakea Pond, as parts of a heiau complex and as the area’s most important archaeological feature. At the Planning Commission meetings, Malama Maha`ulepu raised questions about the current condition of the heiau. In 2006, minimal remains of what had been described in 1974 were evident. Although the heiau is said to be safely buried beneath limestone tailings and quarrying equipment is said to be relocated far from the heiau, we wanted a site visit in order to be reassured about location and condition of this irreplaceable temple. Additionally, Malama Maha`ulepu hoped that the Planning Commission would modify the permit to establish a firm schedule for the long deferred heiau restoration and land reclamation. We also suggested that a substantial fine should be levied if the heiau had been degraded or neglected the point that restoration was impossible. The money could be utilized by other Koloa are groups who are dedicated to preserving the area’s cultural resources. At the meeting on July 27th, Malama Maha`ulepu’s requests for modification of the permit and for sites visits to both quarries were declined by the Planning Commission, although individual commissioners had indicated interest. 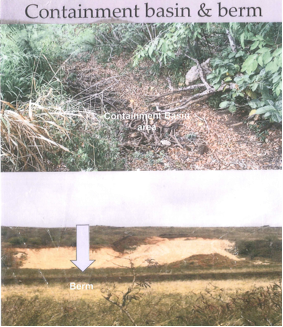 The Planning Director issued a report finding that “Malama Mahaulepu had not provided substantiation for the request for a site visit of a private legally operations commercial quarrying activity” and recommending that “no further action was warranted.” The Director and one staff planner had been taken on a site visit on July 22, 2010. They were not allowed to leave the van and took some photos that were included in the Director’s review. Reports from state agencies and from the quarry operator’s attorney, which had been requested by the Commission, were not produced. Grove Farm announced that Stella Burgess, respected Cultural Manager of the Grant Hyatt Po`ipu and a lineal descendent of the residents of Maha`ulepu, is the company’s cultural consultant. Her deep aloha and sense of the importance of the area is well known. Kumu Burgess announced that she is applying for funding for heiau restoration. Heiau restoration entails an archaeologist’s site assessment including research findings from oral and written history. The archaeologist prepares a restoration plan that must be accepted by the State Historic Sites Division. Heiau restoration can be accomplished quite rapidly using machinery or in the more laborious traditional ways. Ideally, restoration of Waiopili Heiau - as well as the spring and pond integral to its meaning and use - will generate community learning and empowerment. Throughout Hawai`i, including at Nualolo Kai on Kaua`i, area residents, particularly for native Hawaiians and students, join experienced stone masons in rebuilding ancient sites, renewing their powerful presence and spirit. Malama Maha`ulepu works to preserve, for future generations, the irreplaceable natural and cultural resources of Maha`ulepu. We believe that the Kaua`i community and its visitors deserve the continued experience of this beautiful and historic place as an undeveloped area with compatible agricultural, cultural, educational and recreational uses.